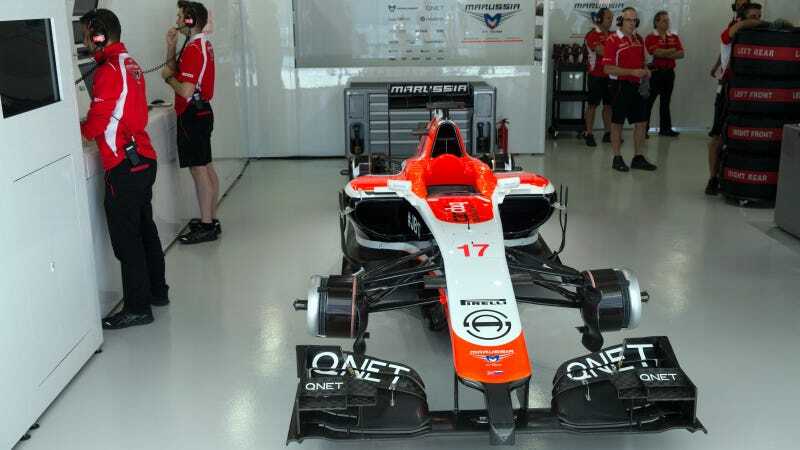 Despite yesterday's Formula One Strategy Group decision that Marussia (now operating as Manor GP) cannot come back on the 2015 grid using their 2014 car, a statement released by the team today indicates that they plan to race anyway. The team formerly known as Marussia found the funding to put forth their entry fee for the 2015 F1 season, with their ninth place finish in the constructors' championship making them a more attractive investment than fellow troubled team Caterham. However, funding came so late that the team wanted to use their 2014 car for this season and submitted a request for an exception to the F1 Strategy Group. In order to run last year's car, they needed the group's unanimous approval. Force India cast that initial, damning "no" vote, and many are calling them out for being hypocritical in regards to the other smaller, cash-strapped teams. Force India got on the F1 Strategy group by scoring the most constructors' championship points behind permanent F1 Strategy Group members Ferrari, Williams, McLaren, Mercedes and Red Bull. During the meeting it emerged that there were compliance issues and that the application lacked substance. Given the lack of information, uncertain guarantees, and the speculative nature of the application, the decision was taken that it is better to focus on ensuring the continued participation of the remaining independent teams. After Force India rejected the proposal, no other votes were necessary, although Bernie Ecclestone told The Independent that "three or four" teams in total were against the proposal. While most of the ire from disgruntled fans who would like to see the ex-Marussia team back on the grid is directed towards Force India for appearing to contradict their earlier stance on F1's cost crisis, this episode proves that the F1 Strategy Group as a whole is a ridiculous sham. Of course teams appointed to the board will vote in their own best interests. Force India and the others receive a larger share of F1's commercial rights income should Manorussia fail to compete in 2015. - On 17 December 2014, the team made a request to the Strategy Group to consider allowing it to use a 2014 race car, modified to meet certain 2015 regulations, for part of the 2015 season. Following analysis, the team highlighted that this would need some form of dispensation on only a small number of clauses in the Regulations. - Subsequent to this application, the team was informed on 5 January 2015, that the Strategy Group felt that two teams - Marussia and Caterham - should be permitted to race a 2014 car in the 2015 championship. The letter stated that the Strategy Group agreed that the car should comply with all of the 2015 technical regulations, with the exception of four articles, those articles being Articles 3.7.9, 15.4.3, 15.4.4 and 16.2. The team can confirm that the modifications to its 2014 car would meet this stipulation. I was surprised to hear some of the comments made today, particularly regarding an application we were said to have made to yesterday's meeting, which I can confirm was not the case. We did make a request on 17 December last year and we have been working since to satisfy the requirements subsequently communicated to us, specifically complying with all the Regulations, aside from the exempted articles. Even though that evidently wasn't the case, Manor is going to try to make it on the 2015 grid anyway. Like Force India, they will likely miss all of the preseason test days, but as long as they can field a car and have a delicious mug full of tears of Manor's Haters when all is said and done, I'd consider that a victory for the smaller, struggling outfit. - The team has been busy preparing its 2014 cars such that they comply with the stipulations of the Strategy Group and at the same time it is pressing on with the development of its 2015 car to ensure it can supersede the 2014 car as soon as possible. - The team has a significant number of staff already working on both its 2014 and 2015 cars. It also has the benefit of being able to recruit further staff very quickly from the rich pool of experienced and talented F1 personnel who were left unemployed following the closure of Marussia and Caterham and due to job cuts made by other teams in the sport. Surprise, surprise. Manor's not dead yet, they have a 2015 car in the works and they'd like their fair chunk of F1's commercial rights money, thankyouverymuch. "We are doing everything possible to adhere to the process set out for us to return to the 2015 grid," explained Lowdon in the team's statement. "This is a fantastic good news story for the whole sport and we just want to go racing." Per RACER, Manor plans to exit administration (Britain's form of bankruptcy protection) through a Company Voluntary Agreement on February 19. The full text of Manor's team statement can be read here.